Blogmas Day 20: My Hopes For The New Year As A Blogger! I've been blogging for 4 years now and to be honest I wasn't really enjoying it. I guess it's my fault because I wasn't writing a lot of the things I wanted to talk about. I was putting myself in a category thinking that's where I should be and then I become stuck. It wasn't until a few months ago when I told myself that enough was enough. I know this has nothing to do with a Christmas theme or a winter theme, but it's something that I want to share. Maybe it will help a new blogger or a someone who has been blogging a while like me. Blogging consistently last month and this month helped me realize that I can do this. You know self doubt is one of the most hardest obstacles. It's like the confidence is not there and you can't find it anywhere. Doing these past couple of months I've been writing everyday and it's made me realize that I have a lot to say. My hopes for the new year as a blogger, is to enjoy it. Blogging is something that I've stuck with and I'm very shocked. I didn't think I could do it and some bloggers I've meant along the way, I've lost touched with because they don't blog anymore. What keeps me going is the people I've met through this experience. When I stopped blogging for awhile, I wondered what was going on. I was curious to know if anyone realized I wasn't there. It made me sad but I just didn't have the motivation like I do now. I hope to expand the topics I talk about on my blog. For example, I want to start talking about my hair and how I care for and the different products I like to use. I want to give tips on how to care for your hair and I want to share my natural hair journey. Which that will probably be a long post, but also helpful. I'm still going to be blogging about beauty, but I'm also going to be writing a lot of lifestyle posts! I like during a certain part of the year I get less motivated. I think during the Summer time, so I'm going to change that. I also want to get more organized, but I will talk about that in another post. I also want to invest more into my blog design. Which coincides with me wanting to blog more. I really enjoy blogging and I think this is my time to show myself that I'm serious. I hope to get more involved in blogger chats on Twitter, I mean it's nice connecting with people who share a common interest. Since I've turned 25, I think the light bulb went off and I had an epiphany. 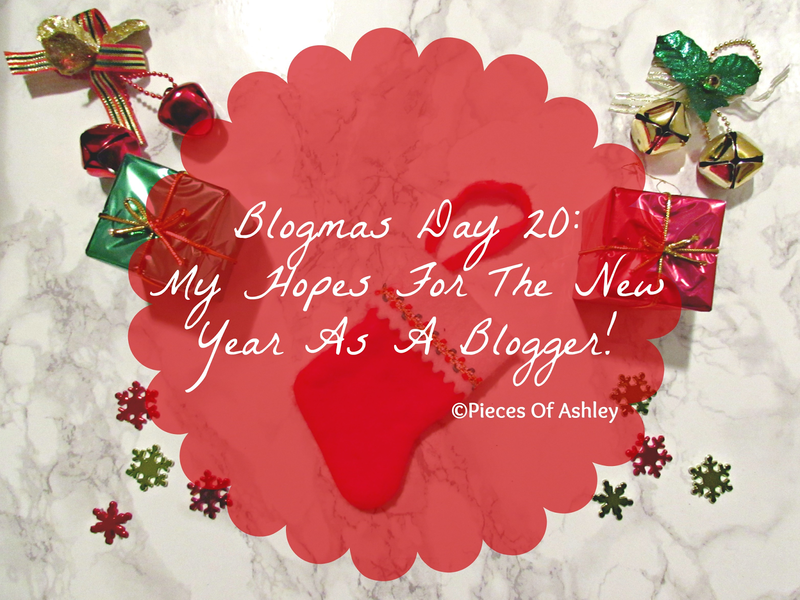 So here's to all my hopes as blogger and I can't wait to start off the new year on a good foot! I hope you enjoyed reading and feel free to share your hopes/ goals for you as a blogger and for your blog.